Research has shown that many people’s greatest fear is that of speaking in front of others. For some, even social situations can cause inner conflict and lack of confidence. Whether in a sales presentation, in front of a group or perhaps when attending an interview, confidence is very important. Speak Out is designed to give you the confidence you need. Speak Out has been prepared to give you the confidence you need in any situation. You will increase confidence and reduce anxiety enabling you to perform at your personal best, whenever you need to. If you are due to go for an interview, make a speech, or are involved in communicating with others at any level, then this audio program will get you prepared in the best way possible. These programs are based in our clinical program for confidence in public speaking. 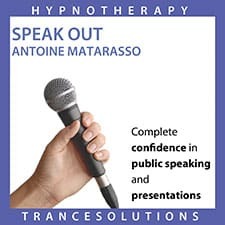 We use these hypnosis audio programs with all of our clinical clients. They reinforce the work achieve in a session and also minimise the number of sessions that many clients need. People who use the CDs regularly see more rapid results that those who don’t make the time.